This factsheet is for women diagnosed with acute fatty liver of pregnancy (AFLP), their family members, and for those who would like to better understand the condition. What is Acute Fatty Liver of Pregnancy? Some women develop a type of fatty liver in the final trimester (last three months) of their pregnancy; this is known as acute fatty liver of pregnancy (AFLP). AFLP is a very rare condition (it occurs in about 1 in 20,000 pregnancies) and is more common in first pregnancies, male babies and twins. What is the cause of Acute Fatty Liver of Pregnancy? It is not known what causes this pregnancy specific liver condition but some feel it is a variant of pre-eclampsia (raised blood pressure and protein in the urine caused by pregnancy). It has also been linked to an inherited enzyme deficiency called long chain acyl-CoA dehydrogenase (LCHAD) in the baby. LCHAD deficiency is a rare autosomal recessive disorder. This means a gene must be inherited from both parents for an individual to be affected. Often men and women do not know they are a carrier of this changed (mutated) gene, as their bodies are able to continue to metabolise fatty acids normally. However, when both mother and father carry the gene and both genes are passed on to the baby, the baby is then unable to metabolise some fatty acids and a build-up can occur in the womb. The un-metabolised free fatty acids return from the baby, via the placenta, to the mother’s blood stream. This can result in hepatic stress for the mother, causing fat infiltrations to build up in the liver (fatty liver disease). What are the symptoms of Acute Fatty Liver of Pregnancy? If you are pregnant and experiencing any of these symptoms you should make an urgent appointment to see your midwife or GP. If your symptoms are severe or begin to get worse, you should go straight to hospital. Acute fatty liver of pregnancy is a very serious condition that can cause rapid liver and kidney failure and can be life-threatening for both mother and baby if not diagnosed. For more information, download the Guide above. If you have any concerns about your health or are showing any symptoms of AFLP (see‘Symptoms’ section of the guide) you should contact your midwife or GP immediately. BACP can provide advice on a range of services to help meet the needs of anyone seeking information about counselling and psychotherapy. A charity established by bereaved parents to support anyone affected by the death of a baby. 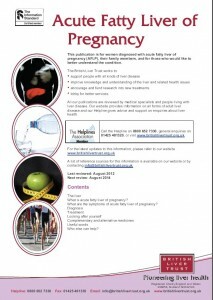 A charity funding research into and providing information on the causes and prevention of premature birth. A charity working to improve the health of women and babies. They do this through raising funds to invest in medical research and the development of specialist medical professionals working in the field of reproductive and gynaecological health.